My little Nina is NINE! She is so cute, with her reddish hair, tiny freckles, and sweet personality. We are big fans of Pippi Longstocking around here, so it was fun to plan a party and pretend we were at Pippi's house! Hooray for Nina! Our little Pippi Longstocking. The first thing to do was to transform our house into Pippi's house, "Villa Villekulla." If you know Pippi, you know that there's really no rhyme or reason to the style of her home, just that it's fun and colorful. I taped up some big sheets of aqua blue butcher paper and made some "shelves" and "picture frames" and other things out of paper to make the space come to life. Of course we had to have a photo of Pippi's papa, Captain Longstocking, who is at the moment sailing the high seas as Pirate King (recognize that little pirate?). Some gingerbread cookies and cookie cutters were strung from the ceiling because why not? Seemed like something Pippi would do, (after rolling out her dough on the floor). I poked holes out of the cookies with a straw before baking. On the wall, a shelf, a pan for cooking Swedish pancakes, a clock, photos of Pippi and her friends and a chalkboard sign made us feel like we were at Pippi's house. Pirate flags finished up the look of since her papa, Captain Longstocking, is a pirate king. Loads of sweets + gold pieces scattered on the table - as I imagine Pippi would do! Another favorite version of the Pippi Longstocking story, along with a small suitcase full of gold, made the centerpiece. Striped straws reminded me of Pippi's "long stockings." Yellow and blue for the Swedish flag (since Pippi is Swedish, you know), and fun striped forks, polka dot napkins and green plates make the party even more colorful. My favorite version of the Pippi Longstocking book by Astrid Lindgren is the one illustrated by Lauren Child. I made a garland using photocopies from this book to add a little more Pippi to our party! Pippi's monkey, Mr. Nilsson, wanted to "hang around" for the celebration. Nina's friends were invited to come wearing their hair "Pippi style" (in braids - or piggytails if it was too short) and everyone become freckled with a few dabs of makeup as they came in to the party. I bought some crazy "long stockings" for the girls, so everyone put on a mixed up pair when they arrived. They loved it! Since most of the girls didn't know anything about Pippi Longstocking (a real tragedy in my opinion, haha), we started the party by watching the first episode of the old Swedish TV series, just to get them familiar with her. Yes, the English dubbing is pretty awful but we have loved this show for years anyway! All the kids loved it and thought it was so funny! Now they were understanding the braids, and freckles and socks, haha. Next we did a simple craft. Since Pippi has a pet monkey, Mr. Nilsson, we made monkey stick puppets. Super easy. I just cut out some simple shapes from brown cardstock, and put those with some glue, craft sticks, pens, and googley eyes onto the tables. Next was the scavenger hunt, just like when Pippi sends her friends Tommy and Annika on a search for surprises. I had rolled up tiny scrolls of paper, and placed them around the house, each one holding another clue as to where to find the hidden treasure - the party favor bags full of gold, Swedish candy, and piratey goods. Last of all - singing "Happy Birthday" to the birthday girl, and cake! 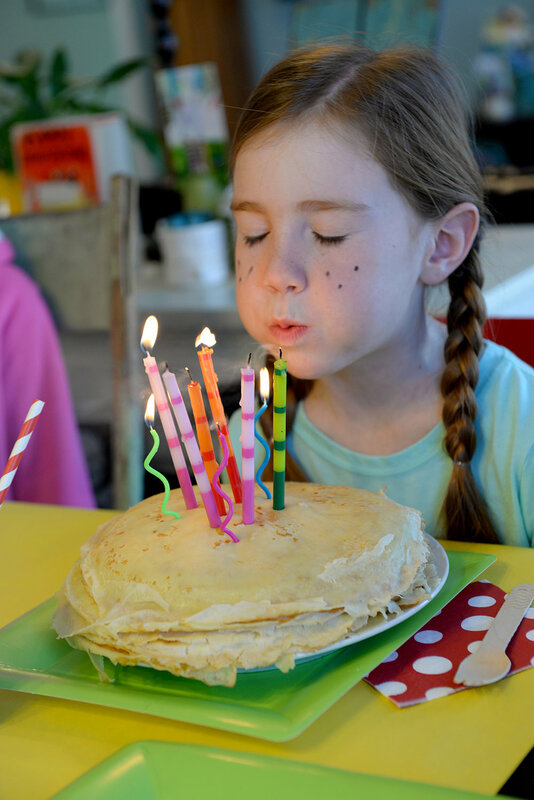 For the cake, I thought it would be fun to go with a big stack of Swedish pancakes, since Pippi is so good at making them! The girls loved rolling them up with strawberry jam or syrup. What a fun party we had. Happy birthday Nina, I love you! !